The AVC community will remember back to this summer when we helped to crowdfund a middle school chess team that was struggling to come up with the money to go to the tournaments it had won numerous times over the past decade. That was a huge success for everyone involved. And like most successes, it brought out other similar efforts. One that I am particularly fond of is at the Park Slope Elementary and Middle School (aka PS/MS 282) in Park Slope Brooklyn. At PS/MS 282, every student learns chess and 50 of the students are selected to represent the school in the state and national championships. Last year, PS/MS 282 won the National Championships in the K-5 category for Under 900. In order to raise the funds to send the kids back to the state and national championships this year, PS/MS 282 is doing a Donors Choose campaign right now. I have given to the campaign and I thought I'd let everyone here at AVC know about it too. 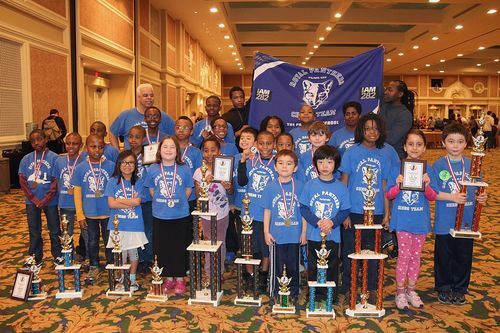 If you want to support public school chess and help these kids defend their title, you can support them here. I am a big fan of teaching chess to youngsters. I think it teaches struggling, persevering, thinking ahead, and getting ahead. I would like to see more of it in our public schools.